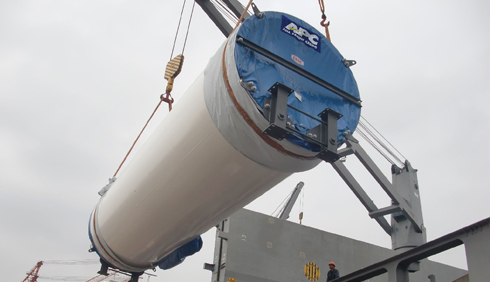 APC Asia Pacific Cargo handled its biggest ever wind power project in November, when the IFLN freight forwarder organized and oversaw the shipping of ten 3MW wind power turbines and associated equipment from China to Sweden. A freighter, Kingfisher, was chartered to take the outsize cargo, which had a total volume of approximately 50,000 cubic meters and weighed nearly 5,000 tons, from the port of Jiangyin, near Shanghai, to the port of Karlshamn, in the south of Sweden. The turbines were destined for a site 40 kilometers southwest of the east coast city of Kalmar. With the wind turbine nacelle 95 meters high and weighing more than 120 tons, plus each blade being 55 meters long, the job was a challenging one. According to APC's Eligio Oggionni, the loading of the blades was particularly difficult, due to their length and shape. Special preparations had to be made for loading and fastening them to the ship. But this is not the only big Swedish wind power move to have been handled by APC. In 2012, it organized the transport of two 3MW turbines produced by the same company, Sinovel, China's largest turbine manufacturer, to a different buyer in Sweden. For that shipment, the outsize shipment had to be re-loaded in Antwerp using small vessels able to navigate the channel into Vänern, Sweden's largest lake. The final site on that occasion was 30 kilometers northeast of Karlstad.